We Transform Business Students into the Next Generation of Managers, Leaders and Wealth Creators. Make the right choice and earn a business degree at the UTSA College of Business. Nationally ranked and recognized, the college offers 12 high quality and comprehensive programs. Become the chief financial officer of a Fortune 500 company, lead cyber security efforts for the National Security Agency or join other Roadrunners on Wall Street. Choose a degree program that complements your interests, study with top-notch faculty and engage with peers that will become lifetime friends. 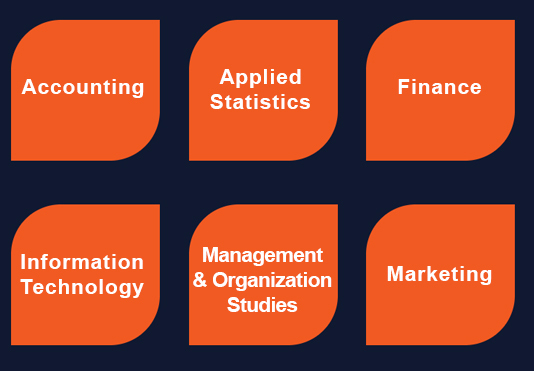 Level up your career with a graduate business degree from the UTSA College of Business. Our programs are taught by top faculty and provide students with technical and professional skills that can be implemented immediately in the workplace in high-demand fields. In addition to our nationally-ranked MBA program, the college offers a variety of specialty business degrees in areas such as cyber security, data analytics and finance. Training bright and motivated individuals with a passion for research is the goal of the college’s doctoral programs. The college offers six doctoral programs: a Ph.D. in accounting, a Ph.D. in applied statistics, a Ph.D. in finance, a Ph.D in information technology, a Ph.D. in management and organization studies and a Ph.D. in marketing. The Center for Professional Excellence is the College of Business’ home for Executive Education programming. Key offerings include the Executive MBA which is a 21-month program for rising leaders focused on current and relevant business issues. The center also offers customized executive workshops, boot camps and customized training in areas such as cyber security, data analytics, entrepreneurship and project management. Why the UTSA College of Business? The UTSA College of Business transforms business students into business professionals by providing students with skills that can be implemented immediately in the workplace. Nationally ranked and recognized, the college is one of the 40 largest business schools in the nation and offers a comprehensive curriculum at the undergraduate, graduate and doctoral levels. We excel at focusing on applied programs in such areas as cyber security, data analytics, accounting and finance. 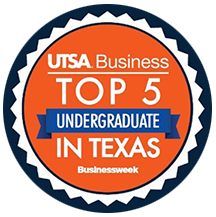 The college was named one of the Top 5 undergraduate business programs in Texas, and UTSA was ranked the No. 1 cyber security program in the country. I never would have guessed how much UTSA has helped me with my personal growth. I’m excited for all that I have yet to learn and gain from my remaining year at UTSA. My passion is finance. And UTSA’s finance program is among the best in the country because of the Investment Society. I’m so appreciative that I came to UTSA. The classes are the perfect mix between hands-on learning and academics. I’ve made lifelong friends, and I’ve found my passion for cyber security at UTSA. Get involved in activities and experiences early in your college careers. Ask a lot of questions and see what is out there. Every experience helps and can lead to new opportunities.